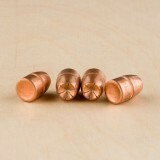 Hornady projectiles have earned a reputation in the shooting community for being reliable and consistent. 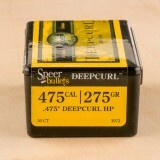 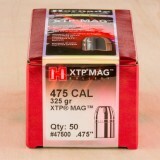 Each bullet in this box of 50 measures .475" in diameter, weighs 325 grain and features Hornady's eXtreme Terminal Performance (XTP) hollow point. 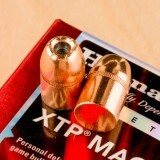 The XTP line is designed to be accurate and deliver devastating controlled expansion upon impact. 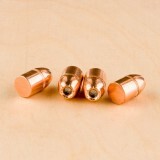 The hollow points have precise serrations cut around the rim and tapered copper jackets to control the expansion rate. 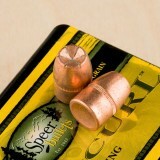 These bullets also have uniform core densities to promote greater in-flight stability.